Let’s not delve too much into the music of Swedish singer, Jens Lekman, because everybody’s familiar with Jens Lekman by now. His latest offering, released last September of last year, Night Falls Over Kortedala became one of the most highly acclaimed records by music critics all around. Not only that, the 26 year old even managed to bag a Gummy Award for Mr Indie Rock, offered to the hottest Indie stars last year. And just so you know, I was actually rooting for Mr Andrew Bird all the way, meaning, ‘Jens Lekman? Why Stereogum readers, why??’. Night Falls Over Kortedala, contains one of the most beautiful, shimmering pop songs that one can ever imagine. But, is it really as beautiful and audacious as some make it seem to be? My first impression of the music was, ‘Woah, cheesy stuff. And people REALLY like this?’ Although most of his songs are considered somewhat cheesy (hard not to notice) albeit stunningly gorgeous, Lekman does make up to the corny balladry by inserting witty, wry, laugh-out-loud lyrics. His music often starts off gloriously, paying homage to the wonderful melodies of the 70s and 60s, thus making it difficult not to follow the words. But the lyrics usually begins from I took my sister down to the ocean, which tansforms into but the ocean made me feel stupid, sings Lekman in that baritone, deadpan vocals of his. Thank you Jens Lekman. Thanks a bunch! 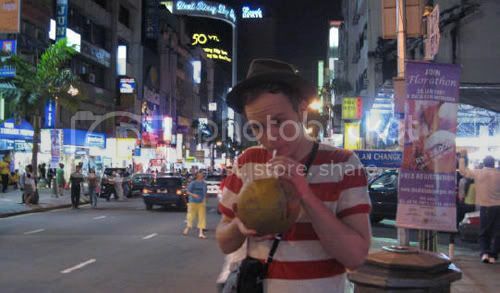 Oooh yes, and before I forget, enclosed is a picture of Jens Lekman in Malaysia. Nothing to celebrate about, I know, but this is possibly the most surreal thing I’ve seen so far. 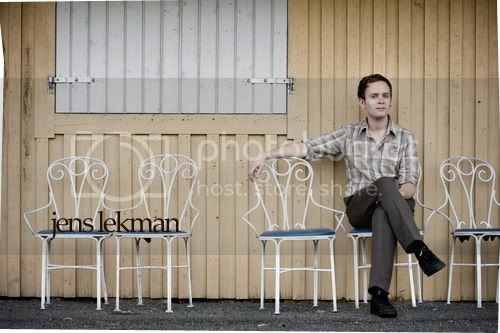 Jens Lekman: Showing some love for the blog.